So you may be sitting there searching ‘newborn photographer Walnut Creek’ or ‘baby photographer East Bay’ and are feeling a bit overwhelmed by all of the websites and photographers in this area. I’ve been through that, so I know how frustrating and confusing it can be to find the perfect photographer to photograph your baby. Here is hoping that this little write up can help you along your way to finding the newborn photographer in Walnut Creek that is perfect for you. Studio or lifestyle are styles that photographers choose to specialize in. Lifestyle photographers come to your home or a location of your choosing and photograph a “day in the life” of your family in that environment. Studio photographers have their own studio space that you visit for your photos. If you’ve just had a baby and the idea of cleaning up your home for a photographer to come photograph you and your family is already stressing you out, then it’s definitely better to go to the photographer’s space. Most photographers in Walnut Creek will have full control and tell you where to look and how to pose. They also like to use multiple props like buckets, baskets, different colored blankets and themed outfits. In my case, I change things up a bit and let the baby guide me through the session. I, of course, have a plan and flow that I usually go through, but if the baby is not feeling up for it, then I go at their pace and flow. We all love the sleepy baby images (who doesn’t!?) 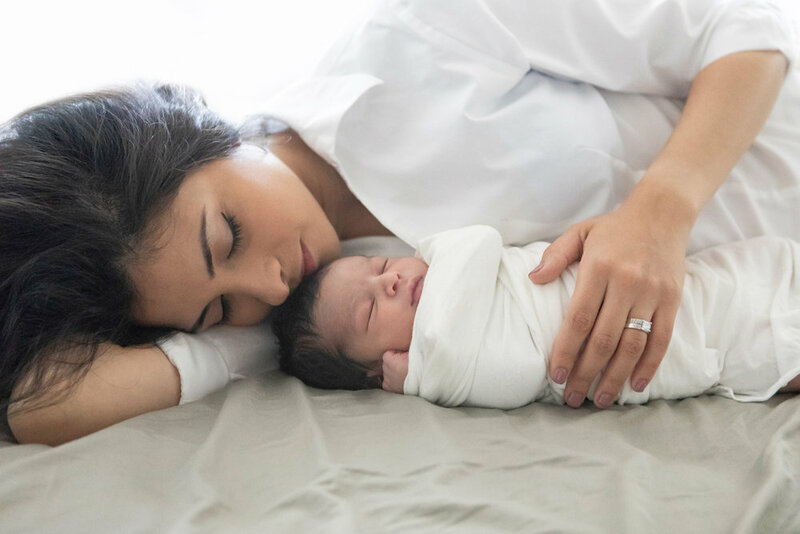 but if your baby is awake, I see it as a great opportunity to catch some active images of them opening their eyes and connecting with you, yawning and being cuddled by you. My style is minimalist, timeless and clean. This means that I do not let props overpower the scene. I believe your baby is enough and I like to capture babies as they are. My focus is to photograph all their details and capture their personality. This means that every family will have a personalized session, because every baby is different. I hope this provided a bit more clarity for you and that you have an easier time choosing your baby photographer in Walnut Creek or anywhere in the East Bay area! If you are interested in learning more about my newborn or baby photo sessions, CLICK HERE . If you want to book a session, CONTACT ME so we can get started!